Pope Francis has decided to make Junipero Serra a saint. Serra was a Franciscan in California who founded many of the California missions in the 18th century, effectively making him an agent of colonization as well as a converter of Native Americans to Catholicism. Building these missions meant forced labor from Native Americans while the conversion process obviously demonstrated a lack of respect for indigenous cultures as well as the compulsion of these conversions. Physical abuse of Native Americans was common, with many recorded beatings and whippings. A lot of indigenous people in California are very upset about the choice to canonize Serra. Serra is far from the only Catholic saint involved in the colonization process. In Colombia earlier this month, I visited the church dedicated to Pedro Claver, a priest who converted slaves. 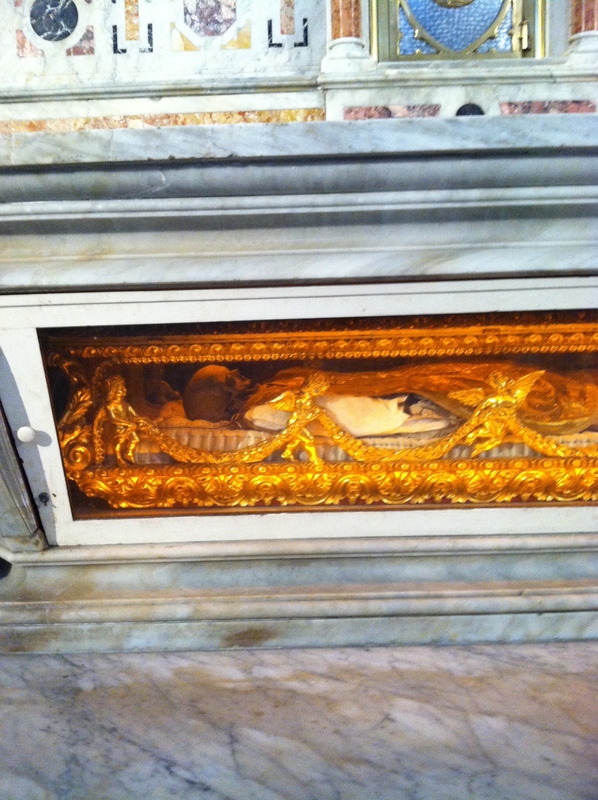 Being Latin America, his remains are proudly displayed on the church altar. The patron saint of slaves supposedly baptized 300,000 African slaves. Of course in doing so, he was part of a system that was capturing Africans, bringing them to the Americans, and working them to death on sugar plantations. Claver was canonized in 1888 so perhaps we can chalk this up to a Catholic church in a different era. But canonizing Serra today, doesn’t that provide tacit approval of a colonization project that led to the repression and genocide against native peoples throughout the Americas? Of course, the Pope is from Argentina, which has far from apologized for its own genocidal project. Ultimately for the church, it still thinks of the forced conversions of the colonization project as a great thing, something for which one deserves sainthood. Having just read Steven Hackel’s biography of Junipero Serra, Michael Joseph Serra was a complex man. Coming from Majorca, there was a complex history he absorbed. Going into the Fransican order, his world view was one of unknowing people needing to be saved. Much like the Jesuits from 1697 who went into Baja California, who had no clue about the native peoples and their cultures. Not much difference than the Jesuits going into Ireland for the counter-Reformation. The attitude that these people’s lives and culture doesn’t matter. What matters is the Roman way. Junipero Serra a saint? What would Saint Francis’s buddy Brother Juniper think?